You are here:Home Marketing & Promotion 31 Book Marketing Ideas You Can Use Today! 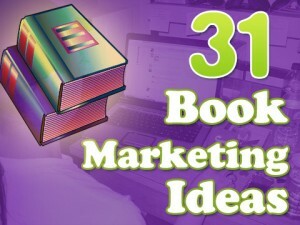 31 Book Marketing Ideas You Can Use Today! Sometimes, you need a quick project. For the past two weeks, my daughter has been teething (read: grumpy) and, as a result, I’ve not had more than 30 minutes to focus on any one activity (save for sleeping at night, blessedly). I suspect that I’m not alone: 45% of us are only able to work for 15 minutes without being interrupted by one thing or another. When you’re facing a day (or week…or month) filled with interruptions and distractions, it’s ideal to focus on quick projects! Knowing what you can complete, however, in such a short period of time is difficult. If you’ve followed us for awhile, you know we think spending time on book marketing every day is an absolute must. To help out my fellow time-strapped folk, I’ve put together a list of 31 book marketing (and fanbase-building) ideas that you can easily complete in a day — or less! Tweet a personal “thank you” to every non-spammer who has mentioned you in the past week. Respond to every comment on your blog. Plan a giveaway — choose a date and write down 3 ideas to build up hype. Contact an indie friend and propose a review exchange. Figure out your best reader hangouts. Set a schedule for writing and marketing (tip: try the Duolit weekly planner, part of our Book Marketing Toolkit). Plan a relaunch of your book. Choose a blog topic for the next four weeks. Add an email list opt-in box to your website. Audit your author website and consider installing a new theme. Examine how your favorite author is reaching fans online; borrow one idea and start using it today. Research blogs on which to guest post; leave a comment and add them to your RSS reader. Create a freebie to release exclusively to your email list; try a short story, alternate-POV chapter or flash fiction. Design limited-edition packaging for your book. Release a snippet of your WIP/next book on your blog — make it a cliffhanger! Write down two new ways you can better engage your readers. Make a personal commitment to respond to every genuine reader email, comment or tweet. Eliminate a social network you don’t like/don’t use to focus on those you prefer. Find a fan’s blog (hint: click on their name in the comments); add it to your RSS reader or leave a comment. Write a quick sentence or two on how you use each of your social networks. What will you post? How often? Who are you trying to reach? Interview one of your readers; find out why they like your work and where else they hang out online. Focus on creating a connection with readers, not just making sales. Craft a perfect elevator pitch. Follow the reader-finding advice of other awesome indies. Why only 31 ideas? I figure those will keep you busy for at least a month! And, if you find yourself with some extra time (lucky), you could easily knock out two or three of these in a single day. Which one of the ideas above will you try today? Do you have another to add to the list? Let me know in the comments! There’s a few of these I need to try: scheduling for the next four weeks sounds like a fantastic plan. I’ve come to a stage where I’m dropping from three (scheduled) blog posts per week to two, so this could be a good time to implement a new scheduling pattern too. I think connecting with readers is a huge thing, really. Commenting on blogs, sharing links, thanking followers – all small steps towards greater social karma. Thanks, Ryan. I always love to hear your thoughts on our ideas! You’ll probably find that dropping blog posts works better all-around; every time we’ve done it (we’ve moved from 5-4-3-2-1 post per week since we started), the decision has never been regretted! Once you’ve built up an awesome collection of posts (which you totally have), it gets much easier to drop down in frequency. Good luck! Guys, it’s like y’all read my mind! Lately, I’ve been feeling kind of blah, not knowing what to do as far as “marketing” and “platform” without feeling like a bot or something. These are awesome ideas that are engaging and authentic. Thanks! Would like to go ahead and do #2: Thanks guys for the awesome mention of Friday Features! Woohoo! Thanks, Yesenia — I always wanted to be a mind reader 😉 Seriously, though, I’m so glad the list was helpful, and you’re most welcome for including Friday Features. I totally know how time consuming it is to put something like that together, so kudos to you for doing it (especially with everything else you have going on)! Brilliant ideas. Most of the them are easy, and fun too. Thank you. Love the “freebie” idea. Aww, thanks, Angela. I love hearing you say that they sound “fun!” We’re all about fun here. We figure, if you don’t like marketing your book, your results will suffer! What a fantastic list of suggestions! Thank you so much for sharing it! I’ve been struggling lately with trying to increase my online profile, and now I know where to start. Thanks, Dimitri! I hope the mini-projects work well for you! I love this list! Bookmarking it to come back again and again! And it was nice meeting you guys the other night at #indiechat. Woohoo! I’m so glad it helped you out, Heather. And it was wonderful to meet you as well. Indiechat rocked! Awesome! Tip 32: Comment on those website who give great advice for self publishers! Tell them you love their blog! I have just started out publishing my E-book exclusively at Amazon.I have few sales already. I want this to be successful. I will try as many of these as i can and respond again later. Thanks for the ideas!